I love to see new landscapes, so traveling is a great inspiration for me. It doesn’t matter what the season is because I’ll usually find something worthwhile. It’s all about ‘seeing’ things with fresh eyes. 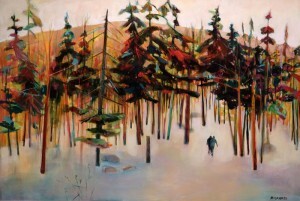 This is a painting from a hike through the woods in the Laurentians. 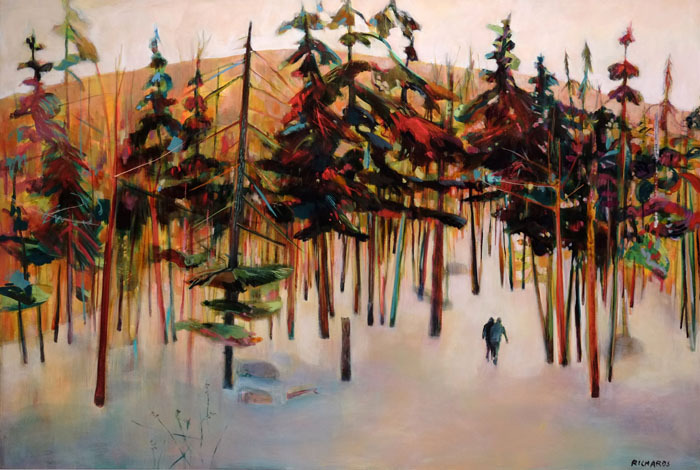 My family has had a chalet in the Laurentians for generations and I have a deep connection to the area, especially around St. Sauveur. It’s changed a lot over the decades (very busy!) but the woods are still quite magical. I often take quick photos to remind me of certain places. The photo’s are really just a reminder of a mood that I experience, to jog my memory when I’m back in my studio. The long straight trunks of this particular stand of trees, and the way the soft overcast light seeped through to the snowy ground… it was so still. I love that feeling in the woods. Looking to get in touch? Please feel free to Email me or connect with me online.